One Day Within Your Courts is Better Than a Thousand Elsewhere! Our readers sometimes ask us, "Please share something about your daily activities." We feel we have been doing that all along as our monastic life is a simple life of prayer, study and work. On the surface it is nothing extraordinary. What is extraordinary is that, by our consecration to God through Religious Profession everything in our day is used by God for His honor and glory and the salvation of souls. My travel alarm, tucked under my pillow, bleeps in the distance waking me from a deep sleep. I fumble for it to shut it off quickly before it wakens my neighbor who was awake at 2 AM for her time of night adoration which we call the Night Guard. While not exactly awake I bless myself and murmur a short consecration to Our Lady. The urge to rollover and get another 40 winks is enormous but I know from experience that most likely I will awaken at 4:55 and in a total panic dress and race downstairs for my 5 AM tryst with our Lord and our Lady. Such an experience colors my whole day and it's not usually a pretty one! So, I pull myself to standing position and dress in the full day habit and head to the kitchen for coffee and breakfast. My little pre-Adoration routine is done pretty much on autopilot! I flick on the small light near the dishwasher and sink and then head into the refectory to hit the switch on the coffee maker so that the early-bird sisters can have coffee ready for them before Lauds. I grab a coffee cup, spoon and plate and head for the instant decaf and turn on that small light, also. I quickly cut a piece of bread and either toast it or eat it as it is with a bit of butter which Sr. Judith Miryam removed from the frig at the end of her 3 AM Guard on the way back to the dormitory. I enjoy the quiet of this pre-dawn time. Sometimes I read for a little bit while drinking my coffee but often times I simply enjoy the quiet. Also, if I read I can get too engrossed and suddenly realize that it is 5:01 AM! 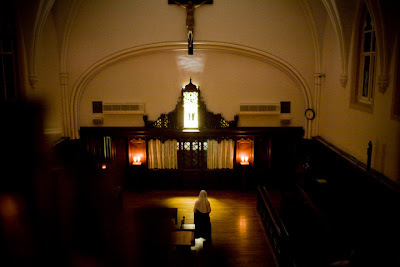 At 5:00 AM I relieve the Sister at adoration. Our custom is that we gather at the 2 kneelers in front of the Blessed Sacrament and bow in adoration in unison. Sometimes I stay there for a little while in silent prayer. Other times I go to my choir stall or sit on the little step between the front stalls, a spot that is a favorite for many of the Sisters. The Sister at the 5:00 AM Guard has the unique experience, similar to the Sister at the 9:00 PM Guard of being a sort of silent witness to the monastery waking up! If it is winter the heat usually kicks on at about 5:10 AM with a crash, bang, bang sound. When I first entered I found this really annoying until a few times when on a cold winter day the heat started to go on but didn't! Now, that crash, bang, bang is a welcomed sound! If it is summer I usually close up the choir: windows, grille curtain, back wall windows and door and get the air condition going so that the choir will be nice and cool for the Sisters when they come in an hour later for Lauds. If it is mid-season all continues to be wrapped in the silence of the night until the 5:20 AM rising bell. As though connected to the bell, immediately one hears the sounds of showers running, doors opening and closing and Sisters making their way to the refectory for coffee or an early breakfast. Other Sisters have early duties like the Infirmarian or Sr. Maureen who goes to the outside chapel to put on the lights and unlock the front doors. Shortly after the bell Sisters begin arriving in Choir for some moments of prayer before Lauds. I can pretty much tell the time by which Sister arrives! This time of prayer is precious but the truth is that I'm still very much a human being and one that is not entirely awake at that! At times I find myself dozing off for a few moments as the rosary slips through my fingers. I don't consider myself a "morning person" but I do cherish that my first moments of the day are spent with our Lord. During this time of prayer I often hold up to the Lord those who have spent the night in suffering or sin. The Psalmist says "at night there are tears but joy comes with dawn." However, I know from experience that often dawn brings with it the simple fact that one is tired, discouraged and worried, especially about those one loves. The 5 AM time of Adoration is a unique hour in the monastery. It is at this time when the truth that we are not just a group of women living in the same house but a community, intent upon God and working together to be united in love.